Drivers have a responsibility to be watchful for other vehicles and to be watchful for pedestrians. Unfortunately, many drivers are failing to live up to this basic obligation. Drivers who don't pay attention could strike other cars and could cause an accident to occur. Distracted drivers are also at significant risk of hitting pedestrians. 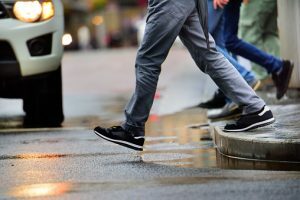 Since it is harder to see pedestrians, who are much smaller than cars, distracted drivers often cause pedestrian accidents which result in grave damage to victims. One recent pedestrian accident in Bradenton, for example, resulted in the death of a 62-year-old man in a wheel chair. If it is determined the driver's actions were negligent and the negligence was the cause of the man's death, the driver could be held criminally responsible. The victim's family could also pursue a civil case to recover wrongful death compensation. My Sun Coast reported on the recent Bradenton accident in which the 62-year-old man lost his life. The accident happened on a Saturday morning when the man was in the westbound traffic lane next to his wheelchair. The man was on 9th Street East and was hit by a 2011 Kia Optima driven by a 21-year-old woman. The 21-year-old driver had two passengers in the vehicle with her as she was driving: a two year old child and a 23-year-old man who is also a resident of Bradenton. The 62-year-old pedestrian was pronounced dead at the scene of the collision after being struck by the Kia. The specific cause of the accident is being investigated. Police are not certain if alcohol was involved in the driver causing the accident to happen. However, My Sun Coast says the reason the driver struck the old man was because the "driver failed to notice him in the road." In this particular situation, law enforcement will need to conduct a thorough investigation to determine why the driver did not notice the man who was killed before hitting him. If the driver was indeed drunk at the time of the incident, the effects of the alcohol could potentially have been a factor in the driver not seeing the pedestrian. Motorists who are drunk often have difficulty paying attention and have delayed response time. If the alcohol was affecting judgment and cognitive function, the driver may simply not have been able to pay enough attention to see the pedestrian.